I have to admit, Fall and I have a love/hate relationship. I’m a summer girl. I live for the long nights, campfires, float trips, rodeos, trail rides, swimming, going barefoot, and everything else that comes with summer. I’m even OK with the sultry, hot days, and the bugs. Can’t have the good without the bad, right? And I’ll take summer however it decides to present itself. This past weekend was the weekend. Weaning day. It’s always fun and exciting, gathering our small herd of cattle on horseback and pushing them the mile or so down the road to our home pasture and our working pens. On this morning our good buddy Kenneth was there to help. I recently participated in my first EVER beauty swap! Thanks to Crystal Cattle and Messy Kennedy, it was super easy. Never heard of a beauty swap? It’s a super cool thing where two ladies are paired, make contact and share a little info about themselves, and then send each other a fun care package of their favorite makeup! This is PERFECT for the average ranch or farm wife, because I think the majority of us don’t have a lot of time, or money to devote to trying new makeup. What a cool thing to get to share your favorites with someone, and be sent theirs in return! 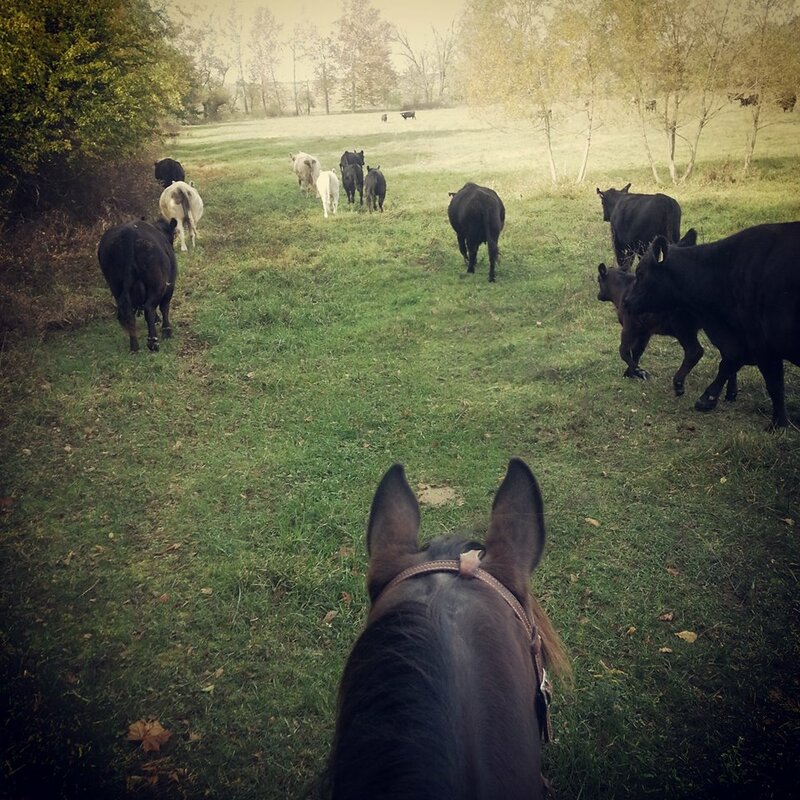 We raise black angus-cross cattle and maintain a small herd of 25 momma cows. Each one of these cows have been bought by us almost one at a time over the years, and several members of our herd have started out as bottle calves. They each have names and can certainly be classified as pets to our family, we know their personalities, their history and their temperaments very well. In short, we LOVE our cattle. 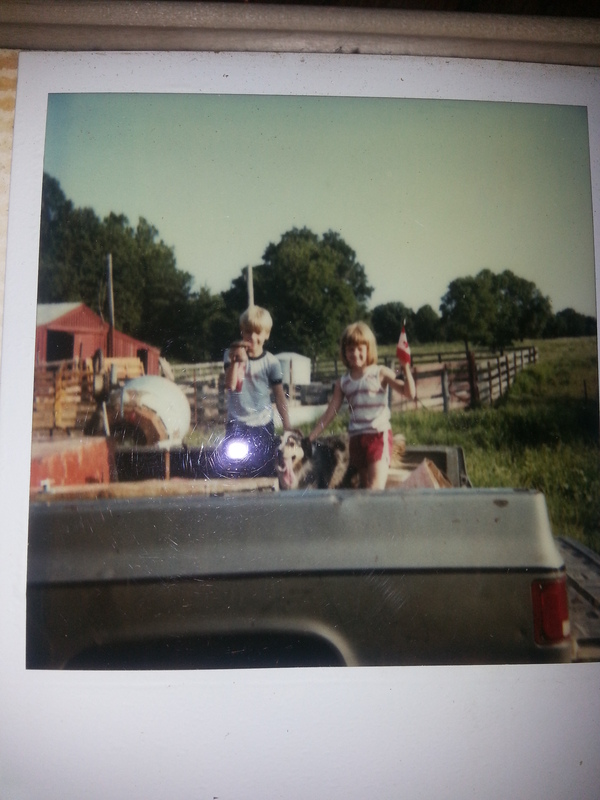 My brother and I in the back of the “muck truck” with our good dog, Mickey, and the main hog barn in the background. Circa 1985. When I was a little girl of about 8 years old, we raised hogs. Not just a few here and there, but lots, and lots of hogs. I have no idea how many, I was 8. Still, I know there were LOTS of HOGS on our farm. Along with cattle, and sheep and horses, and other furry critters. But this story has to do with our porcine, curly tailed friends, the piggies. On this clear, beautiful October day in Missouri, it was time to take a load of hogs to the auction barn and sell them. My older brother and I were excited at the prospect of a trip to town and a chance to get off the farm.